Is Letting Your Chickens Free Range Right For You? When we built our chicken coop it was the standard 3 feet of coops space and 10 feet of run space per hen. It was quickly apparent they were not happy in that little space. The easiest solution was to let them out to roam every day while I could supervise. Pretty soon that turned into I let them out to roam every day. Not long after they started to roam constantly during the days. Fast forward four years and those original three chickens turned into eight hens and four chicks. We expanded their coop, dismantled it and built a larger one. They still have the requisite 10 feet of run space because the city wants to see it for permitting purposes. Plus, it’s nice to feed the birds without the goats butting in. But mostly, I prefer it if my birds do my lawn mowing and pest control for me. (Related Post: 55 Best Chicken Coops For Practical People). I really love letting my birds have free access to my yard, but there are some adjustments in how I manage the backyard farm to accommodate for their antics. 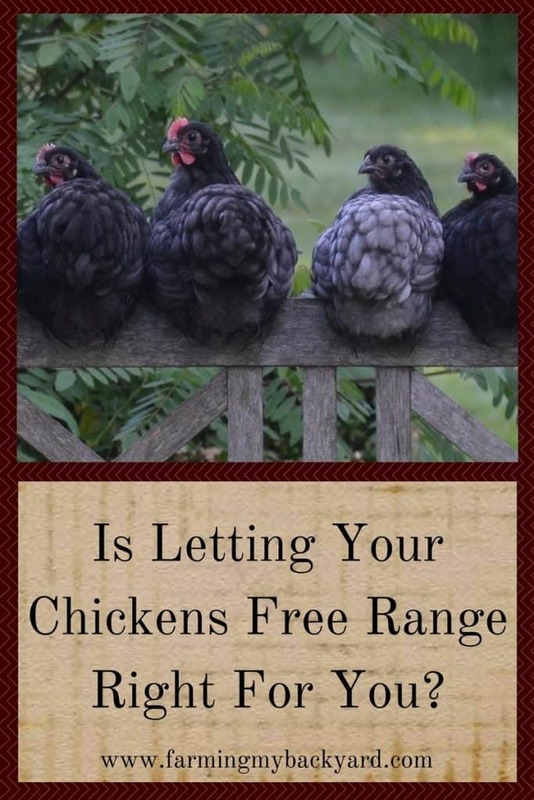 If you want even more details about how to free range your chickens, check out the book Free Range Chicken Gardens. Here are some things to think about before you decide if you should let your chickens free range across your property. For the first few years I would have to scour the yard looking for eggs. My kids would laugh at me as I crawled on my belly under bushes, parting the leaves of the plants. It’s pretty obvious when there is a hidden cache, because I can hear their egg laying squacks but there are no eggs in the nest box. After the first few times I’ve tried to make their nest boxes the perfect place for them. I have fewer missing eggs, but we still get the occasional surprise out in the garden. My hens prefer low, dark, places to lay their eggs. If you stick your hand under them to grab eggs while they are still laying that hen won’t be in the box tomorrow! Try to leave them alone as much as you can. Sometimes breakfast just won’t wait though! They also are picky about cleanliness. If the stray poop ends up in the nest they tend to get crabby and start wandering. When I head out to feed them in the mornings I make sure to re-line their nests. I have also noticed they prefer nesting in softer areas. I was lining their boxes with straw until they decide the goat manger was more to their liking. Try lining their boxes with hay if this is an issue for you. Chickens generally like to share nests and a good rule of thumb is three to four chickens per nest box. My eight hens seem to all go for the same spot in the coop and my older hens started getting aggressive with some of the younger ones. I realized that the spot they prefer is more secluded from the ramp up into the coop and so I switched the direction the second box was facing for more privacy and added a third box on the lower level for the very bottom of my pecking order. (Related Post: The Secret Trick To The Best Nest Box Ever). A couple of plastic easter eggs in the new spots were all the encouragement they needed to check them out. If I’m aware of my birds, and understand what they are looking for, I can accommodate their needs better and they accommodate me by laying egg where I want them. But it’s not foolproof, and occasionally you will still need to look in strange places for eggs. If your birds spend most of their time outdoors they will need a smaller coop. This works for our flock because they have plenty of roosting space and various locations throughout the yard. Your chickens still need places to get out of the weather and just hang out. Our coop is super duper rodent, raccoon, possum, and skunk proof (all creatures we’ve had passing through our yard) and the hens get let in and out each morning and night. (Related Post: Predator Proof Chicken Coops: A Simple Way To Protect Your Flock). Our entire from and back yard are fenced. The front fence is shorter then the back and my more active birds can hop it. If you have a similar issue, only let them into that area with supervision. Good fences not only keeps your birds in but it also keeps stray children and dogs out. If your chickens can get out your fence and into the neighbor’s yard, free ranging might not be the best option for you. (Related Post: 15 Chicken Keeping Mistakes To Avoid). Chickens can be quite proficient at hiding themselves in bushes and plants from overhead predators. Many of them will stay away from the fence, and are accustomed to their “boundaries.” I make sure to clip their wing feathers to make hopping fences more difficult. It’s a good idea to have a large enough pen where your birds are happy enough until you’re able to get out and fix any gaps in your fence, make sure you have enough plant cover, or everyone’s wings are trimmed. (Related Post: Trimming Flight Feathers On Your Chickens). There are two big downsides to free ranging the hens. I do not like stepping in chicken poop or having them escape into a newly planted area of the yard. It’s not too difficult to scoop the chicken do along with the doggie do. Also my kids are really good at watching where they walk, so that’s how we handle that. 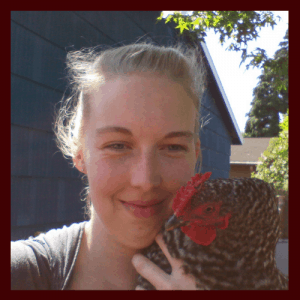 The land mine problem was actually a big deal for my husband, and changed the way I manage my flock. It’s a good idea to keep your spouse happy, even if that means the birds spend more time in their run. Last year I fenced off a corner of the yard to plant some vegetables and the chickens and the goats worked in tandem to knock it over and destroy my seedlings. Definitely need to work out a more permanent solution for that corner! My other two garden areas have solid fences separating them and the chickens are only allowed to free range in those areas during times of the year when I am not planting. If you want some more ideas on how to peacefully garden alongside chickens, I really recommend you check out the book Free Range Chicken Gardens. Chickens and gardens do actually benefit each other however! They really enjoy getting in there in the spring and digging up worms with me as I get the garden ready, and they love the shade of mature vines. Clean up time is fun too, as I weed out the finished plants they get to eat their fill of whatever bugs or stray tomatoes we unearth. I have found it very effective to plant potatoes in the main chicken yard. While potato plants are poisonous, my chickens leave them completely alone. They have enough other yummy food and grass and clover that they are not so desperate for greens that they would poison themselves. Did I mention that our super duper critter free coop is goat proof too? My goats go crazy for chicken food so I either feed the hens while I milk the goats. Alternatively, I leave their feeder in the bottom half of the two story coop and there is a mini door that the chickens fit through, but only the goat’s noses can get into. I’m certain that free ranging the birds decrease the amount of feed I have to buy. I let the clover grow in the lawn as a mini-pasture and they keep everything nicely mowed. They also have free range in the compost bin and treat themselves to scraps while at the same time turning it for me. Everyone kept telling me that the hens would kill all the grass. Well the hens could hardly keep up with the grass until we chopped down some trees and bushes and brambles in the back and accidentally smothered the lawn right before winter. I’ve since planted more grass and it’s coming in nicely even with the goats and chickens free ranging. The only places that aren’t growing are where I clomp around. Plus all that delicious grass makes the most amazing eggs. According to Free Range Chicken Gardens by Jessi Bloom that the minimum space requirement to successfully free range hens is about 250 square feet per bird. Less space than that, and you’re going to have problems with your yard turning into dirt. If your yard is dirt, just make your birds a pen and grow food for them instead. My birds have more then that amount of space right now, but I may need to curb my chicken collecting in a couple years as Edward insists on running a chicken retirement home for all our birds. Do you free range your birds? Part time or full time? What issues have you run into and what kinds of solutions have worked for you? Overall there are so many benefits to free ranging my birds that the down sides are hardly a bother to me. If your situation isn’t appropriate for full time free ranging, even part time can be good for the birds and super fun to watch. If you let your birds out in the evening they won’t wander far before returning home to roost for the night. It sounds like you are able to enjoy raising hens a lot more, when they are free range. I think it’s important to look for ways to find joy in everything we do, rather than simply regarding it as a chore. Great article on the many benefits of free-ranging! Thank you for sharing with the Clever Chicks Blog Hop this week! I free rang my girls when I can go out and keep track of them. Am thinking of sectioning off a part of the yard just for them, so I can let them out more. More space is better! I’ve had to increase my run and decrease my free range space lately because they were starting to venture off into the neighbors. Good fences make good neighbors certainly applies. I looked up caged chickens to see what they ate. Looks like the same thing I feed my free range birds. I’m staying at a piece of property, one of my duties is taking care of these birds. Here is my question; what is the advantage of free range over caged birds. Caged birds eat just feed, while free range, at least the ones I watch, eat worms, spiders, bugs, and anything else. I don’t eat the eggs, I’m concerned that there may be just a hint of worm. Caging chickens is not ethical. Birds that are free to scratch in the dirt, dust bathe and express normal chicken behavior have a much higher quality of life. The bugs and worms and things cut down feed costs, and provide lots of good quality protein and nutrition. There won’t be any bugs in the eggs though! The ovaries and oviduct are not connected to the crop and stomach. Now that we’re letting them out for an hour or so in the evening they are laying fewer eggs. They aren’t laying outside because we can see them (we only have 7). Why is this? We went from 5 to 7 eggs one day and as soon as we started letting them out we’ve gone to 1 or 2. I would try keeping them in a few days and see if their production goes back up. Or it’s possible that they are laying their eggs outside. Unfortunately we can’t free range our chickens – we have too many predators, large, small and airborne. I wish we could though; we wouldn’t have such a tick problem I bet! I’ve heard that guinea fowl are good for ticks too. But they still are vulnerable to predators.